Axillary nerve dysfunction is nerve damage that leads to a loss of movement or sensation in the shoulder. Dermatomyositis is a muscle disease that involves inflammation and a skin rash. It is a type of inflammatory myopathy. Duchenne muscular dystrophy is an inherited disorder. It involves muscle weakness, which quickly gets worse. Facioscapulohumeral muscular dystrophy is a muscle weakness and loss of muscle tissue that gets worse over time. Femoral nerve dysfunction is a loss of movement or sensation in parts of the legs due to damage to the femoral nerve. Mononeuropathy is damage to a single nerve, which results in loss of movement, sensation, or other function of that nerve. Muscular dystrophy is a group of inherited disorders that cause muscle weakness and loss of muscle tissue, which get worse over time. Myasthenia gravis is a neuromuscular disorder. Neuromuscular disorders involve the muscles and the nerves that control them. Sensorimotor polyneuropathy is a condition that causes a decreased ability to move or feel (sensation) because of nerve damage. Electromyography is a test that measures muscle response to nervous stimulation. 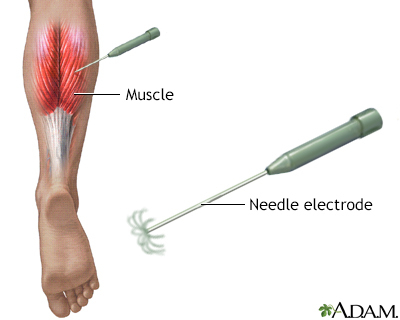 A needle electrode is inserted through the skin into the muscle. Each muscle fiber that contracts will produce an action potential. The presence, size, and shape of the wave form of the action potential produced on the oscilloscope, provides information about the ability of the muscle to respond to nervous stimulation.